Quality Refurbishment is carried out on Slew Rings on all types of Excavators, Tower Cranes, Mobile Cranes, Mini Excavator; Access Platforms and many more machines. Also, Turning Rings on Production Line Machinery, Carrousels, Turntables, Rotary Circles, Boom Conveyor Slew Rings, Screen Tower Slew Ring Bearings, etc. In the case of any other type of Slew Ring/Turning Circle not mentioned or for further information please contact our sales department. A certificate of conformity is issued on request. An advisory service for more specialised requirements is provided by our engineers free of charge. In view of our commitment to quality, refurbishment and prompt service, service exchange is an important element of the company's slew ring activities. Our stores contain a comprehensive range of service exchange slew rings. B & C offer competitive prices for the repair of slew rings. You will receive an immediate response to enquiries on price, availability and despatch from one of our service representatives. The Company can also supply new slew rings of any make at very competitive prices, as well as new pinions, bevels, spurs etc. B & C can recondition any make of gear up to 5 metres in diameter. 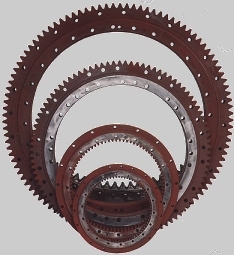 The Company has experience and knowledge of reconditioning travel gears, slew pinions, girth rings, crusher gears, crawler crane gears, slew ring gears, production line gears, mill gears and many more. B & C offers quality refurbishment to the cement works, brickworks, aggregates industries etc. quality refurbishment is carried out on all types of gears and worn teeth are built up and finished to their original contours and hardness. All gears for reconditioning are crack tested before and after reconditioning and all go through our quality procedures using equipment, materials and testing in accordance with the requirements of BS EN ISO 9001. All carry a warranty.